What is the first thing you do when you fall? You probably throw your hands out as fast as you can to brace yourself (unless you're like me and fall head first). Now imagine falling off of a motorcycle onto some very abrasive pavement, yikes -- those precious hands are going to be the first to go. But don’t worry, there's hope! Introducing: the new Dainese Carbon D1 Short and Long Gloves. 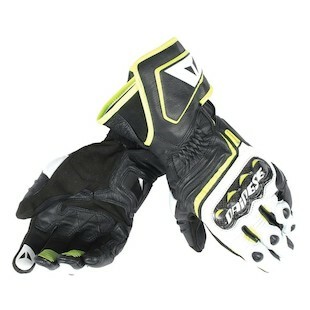 The Dainese Carbon D1 Short Gloves are incredibly comfortable while still maintaining that quality level of protection. The glove is constructed of goatskin construction and a full Clarino palm with leather reinforcements. The knuckle is carbon with accordion stretch across the fingers for better movement. We are losing a full leather palm for the Clarino, but we still feel this is an incredible glove with a lot of great protection. I speak from experience when I say* you will be pretty disappointed if you come off your bike without some gloves -- I wish I had a pair of D1 gloves on hand during a couple of spills. The Dainese Carbon D1 Long Gloves. Now does anyone want to guess what the major difference is between the short version versus the long version? Fortunately I have not lost hope in all of you and I am going to assume you guessed that the glove is a bit longer in the wrist. If you guess incorrectly, well, hang in there, maybe next time we can find an easier question for you… The Carbon D1 Long Glove will come equipped with all the great features of the D1 Short, along with additional wrist protection. Your hands are pretty important and they deserve some quality protection. 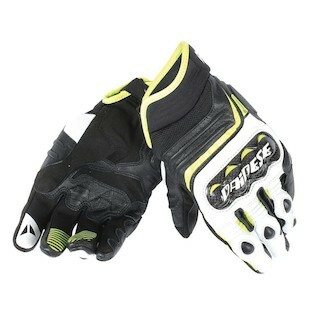 Luckily Dainese has got you covered if you are finding your fingers naked in the wind. Ride safe out there and seriously, wear some gloves, you won’t regret it (insert thumbs up emoji here).